U.S. 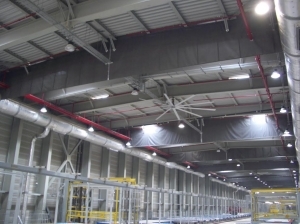 Smoke & Fire – SD60 Fixed Fabric Draft Curtain® – Utilized in warehouses for smoke zoning and separation and for aircraft hangars as part of NFPA 409 compliance. The system can be free hanging or mechanically fastened in place.